Blueberry Muesli! A healthy, vegan and gluten-free breakfast that’s packed with fiber and nutrition. So simple to make! But then, BL and I headed down to New Zealand this winter and oatmeal/muesli is EVERYWHERE for breakfast. Little coffee shops, cafes and hotel restaurants all boasting about their bowls of muesli to start the day. Something weird happens to me when I travel and see the local food available. Even if I wouldn’t eat it here, I have to have it when I’m there. (See also fermented everything in Prague and baked beans for breakfast in England). I’m not exaggerating when I say that two bites into my cherry muesli bowl in Queenstown and I was hooked. Hooked with a capital H. BL asked for a bite and I gave him the teeniest, tiniest little nibble of my spoon. Gah, I didn’t want to share this beautiful bowl of goodness! I got the exact same thing the next day, and the rest is history. I think many of you may feel the same way about oatmeal. 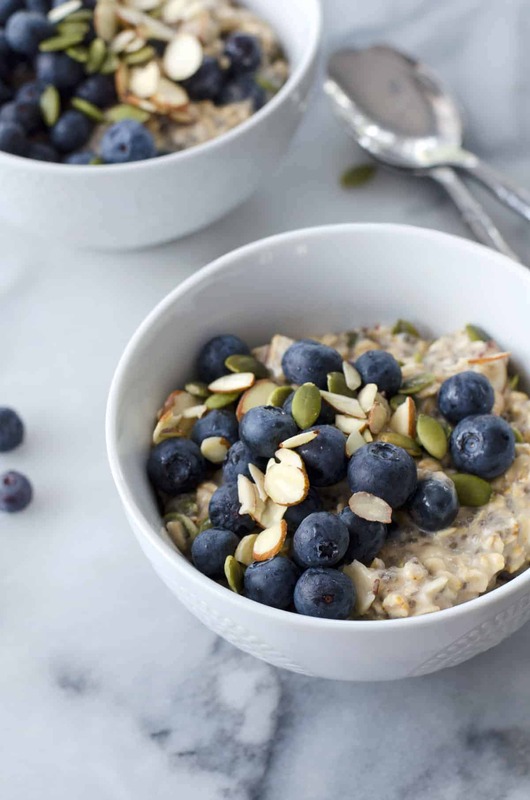 So, even if you think that you aren’t a fan of a morning bowl of oats, you must try this muesli bowl. It’s oatmeal, but not really. Thick, creamy and studded with lots of texture, it’s a wholesome way to get in a lot of nutrients before 9AM. I’m having a love affair with blueberries lately, so I knew I wanted to use them in this bowl. (Also, I can get a pint for $0.99 at my local farmers market, so #winning). Per usual, this recipe is adaptable to whatever you have on hand. Strawberries, cherries, raspberries, mango- it all works. If it tastes good in your hand, it will take good in this muesli. 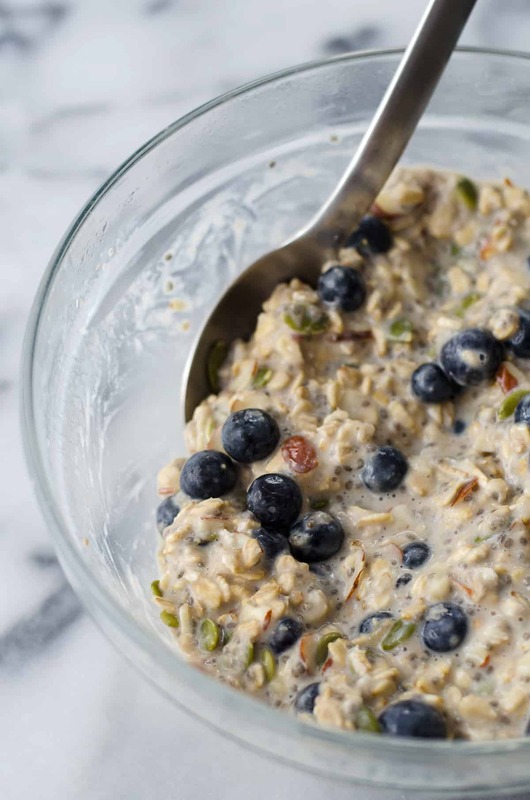 Muesli is similar to overnight oats in texture, but with a little more brightness. 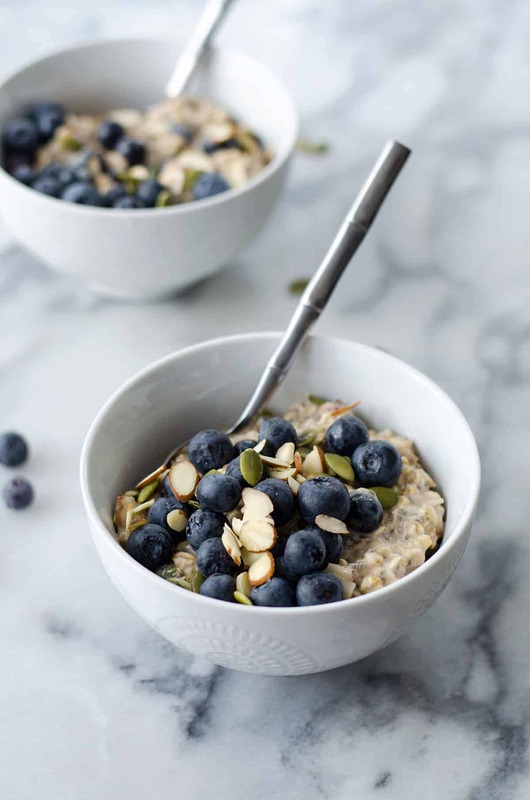 When I first fell in love with muesli in New Zealand, they serve theirs with plenty of local, grass-fed yogurt, which makes you feel like you are eating oatmeal ice cream for breakfast. In the best possible way. I kept this bowl dairy-free, but you are welcome to add in a dollop of yogurt for a creamier bowl. 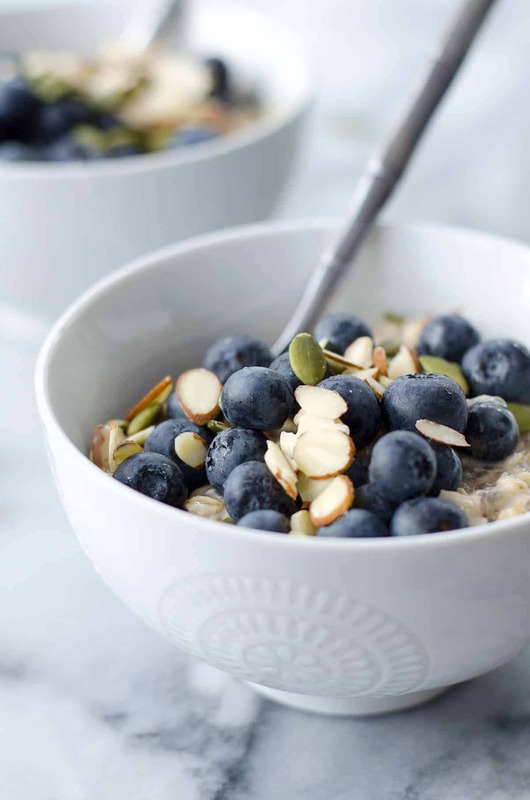 Lastly, this recipe will work (and taste great) with regular almond milk, but if you want the best muesli bowl of your life, try it with homemade almond milk instead. It’s a few extra steps, but not too much work, an totally worth it. 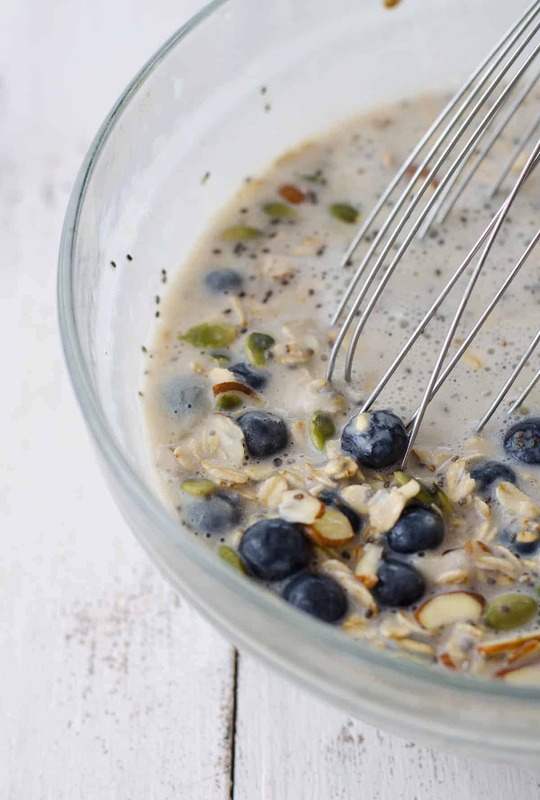 I hope you’ll join me on the oatmeal love train and make this bowl of muesli soon! Oh, and the absolute best part about this breakfast!? You make it the night before so it’s ready in the morning when you wake up! Considering my mornings are one of the most hectic parts of the day, I love a breakfast that I don’t have to do anything to – except grabbing a spoon to eat. Combine the banana and 1/2 cup vanilla almond milk in a blender and puree until thick. Pour into a large bowl and add the remaining ingredients. Whisk together until combined and cover. Refrigerate for at least 6 hours, preferably overnight. 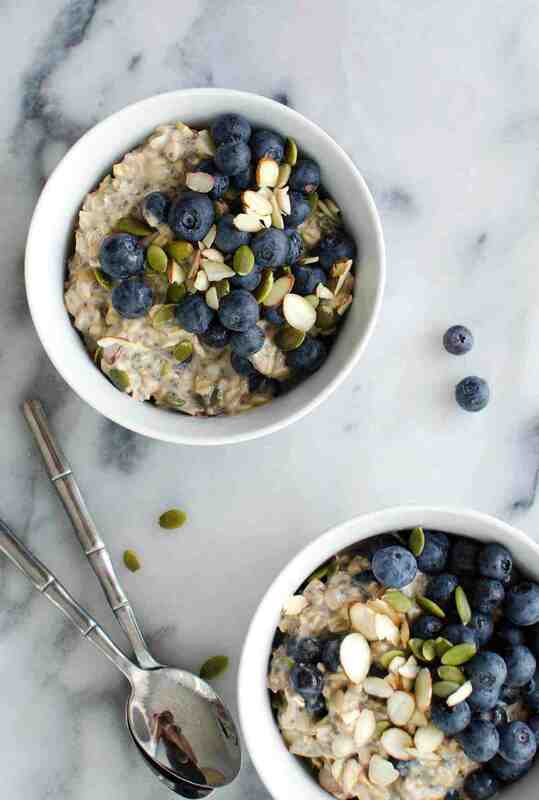 Divide into two bowls and top with blueberries and drizzle with maple syrup! Looks tasty! I have never made muesli but have had it on my travels so I’ll have to check this out! Your pictures are gorgeous! Looks delicious! I grew up on muesli and fermented milk. Now I enjoy it with everything from kefir to yogurt to almond milk. I still have to try making my own almond milk…I know once I do it will be hard to go back! It is! There are a few that live up to the homemade version (Pacific Foods and Califia Farms are my favorites). It usually doesn’t make a difference, but I think it does in this recipe. Haha, I could never pass up a bowl of oatmeal of muesli! Yes! I’m actually surprised how much i love it, it’s a perfect make-ahead breakfast option!